THE Museum has, among its photographic collections, two cameras associated with T. E. Lawrence, better known as 'Lawrence of Arabia'. (see Items 21 and 57). Like a number of other objects in the Museum they are good examples of their kind but not necessarily the most technically advanced of their time, being famous more by association than in their own right. Thomas Edward Lawrence was born on the 16th August 1888 in Tremadoc, Caernarvonshire. When he was young his family moved home frequently until settling in the summer of 1896 at 2, Polstead Road, Oxford, in order that Lawrence could be enrolled at the City of Oxford High School for Boys in George Street, which had been established jointly by the Oxford City Corporation and the University in 1881. In Lawrence's time the school already had a strong academic reputation; Lawrence went on to Oxford, along with about half of his year, entering Jesus College in October 1907 to read History. Whether Lawrence used his father's camera on this occasion, or whether he had one of his own, is unclear. His father's camera was given to the Museum in 1969 by A.W. Lawrence, Lawrence's younger brother and literary executor and later Professor of Classical Archaeology in the University of Cambridge. The camera (Inventory no. 92,030) is a half-plate field camera measuring 20 x 20 x 6 cm. It exposed 16 x 12 cm photographic plates and, according to A.W. Lawrence, was being used by his father by 1890. Its basic design is similar to the well-known contemporary Watson half-plate field camera, but with rack-and-pinion focusing on the camera's back rather than on its front. The signature on the camera reads 'R & J Beck London No 420'. This firm was established in 1843 as Smith and Beck, became Smith, Beck and Beck in 1854, and finally R. and J. Beck a year or two later. It was a noted firm of optical instrument makers which had first established a reputation for fine, high-powered microscopes. They later became well-known for their photographic lenses, but until the end of the 1880s nearly their entire output was exported to America. Indeed, the lens associated with the camera is not by Beck but is a symmetrical-meniscus doublet lens of approximately 185 mm focal length inscribed 'PATENT TAYLOR, TAYLOR & HOBSON LEICESTER No 7940'. This firm was founded in 1886 by Thomas Smithies Taylor who had himself spent part of his apprenticeship with Beck in London. Thomas was soon joined by his brother William, and in September 1888 by Herbert Hobson, when the firm took on the name on the lens. Taylor, Taylor and Hobson of Leicester produced a vast range of photographic lenses which were highly regarded in their day. Secured to the base of the camera is a solid aluminium mounting for fixing to a camera tripod, inscribed with the words 'McKELLENS PATENT'. S. D. McKellens of Manchester was a watch and clockmaker who in the early 1880s turned to designing a lightweight camera for his own use, but which turned out to be so successful that he became a manufacturer of cameras and accessories. The earliest photographs by Lawrence that survive (apart from the group photograph of his classmates) are a series of pictures of French castles taken in 1907 and 1908. Lawrence had visited France without a camera a year earlier, including the castle at Fougères, vowing to return either with his father's or his own camera, as the place 'was a paradise for a photographer'. On his return to France, Lawrence was accompanied by his classmate C. F. C. Beeson, himself a major benefactor of the Museum. During the trip Beeson drew many fine drawings of the castles, which later appeared in Lawrence's thesis. Lawrence's intention to write a thesis had been strengthened by new regulations introduced in 1907 by the Oxford examiners in Modern History, which allowed students to submit a supplementary thesis related to one of the special subjects they had chosen to study. Lawrence's initial special subject was 'Military History and Strategy', but soon after returning to Oxford from his 1908 trip, he discussed the project with C. F. Bell of the Ashmolean Museum who suggested that a more interesting topic would be a comparison of the castles of medieval Europe with those of the Crusaders in the Middle East. This suggestion seems to have met Lawrence's approval, as he soon embarked on a three-month walking tour in Syria. Alas, calamity struck early on, for shortly after taking some photographs of the castle at Urfa his camera was stolen. Lawrence graduated with a First in Modern History in 1910. Later that year he had a camera built for him specifically for taking high-quality photographs of crusader castles and it is this 'archaeological' camera that is now in the Museum's collection (Inventory no. 81,355). Like his father's, Lawrence's camera was given to the Museum by his younger brother. Its main body measures 15 x16 x10cm and it was almost certainly either made by J. H. Dallmeyer of London or contracted out by them, as was their custom. It is a conventional, shallow, box-form, front-focusing mahogany camera of its time, with a rise, fall and swing front lens panel which could be used for correcting converging verticals in architectural and archaeological photography. Similar to Dallmeyer's 'Correspondent Camera' introduced at around this time, the base board, which also drops away for wide-angle use, has a reflex viewfinder, and there is a ball-bearing levelling device on top and a metal plumb-line (inscribed 'DALLMEYER') on the right-hand side. The ivorine focusing-scale on the base board, calibrated in feet and metres, is inscribed '2. II. J. H. D.', and is intended for a lens with a focal length of 135 mm. The camera is fitted with a 'compur' shutter, timed for speeds from 1 to 1/250 of a second. The five lenses consist of a wide-angle by Ross and Company and four miscellaneous lenses by Dallmeyer, including a telephoto device with rack-and-pinion motion. There is also a telescopic lens-hood, a medium green filter and an aluminium eye-piece magnifier. 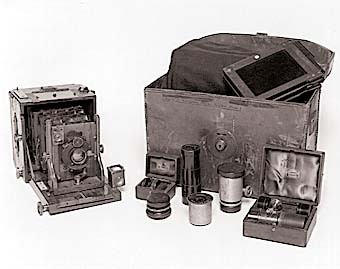 The camera, its four mahogany, book-form, double dark slides (for glass plates), numbered 1 to 8, and a black cloth all fit into a stout leather carrying case inscribed: 'Property of T. E. Lawrence, Pole Hill, Chingford, Essex'. Seen as a whole, it can only be regarded as a well appointed outfit put together by a serious photographer. Already on board ship in December 1910, once again en route to Syria, Lawrence was experimenting with his camera. He boasted in a letter home that with its x18 magnification lens it performed better than his binoculars in distinguishing features on the shoreline. A little improbable perhaps, but Lawrence referred again to his use of the telephoto lens in his Carchemish excavations, finding it better for viewing distant objects than the naked eye. Lawrence joined D. G. Hogarth's British Museum excavations at Carchemish in Syria in 1911. Hogarth had been appointed Keeper of the Ashmolean Museum in 1909 when Lawrence first got to know him and they had developed a close friendship. For four years Lawrence was in charge of the photographic recording of the site at Carchemish and its finds, being responsible for the expedition's three cameras as well as his own. According to his letters home, in the 1911 season alone he took some 200 photographs of the excavation, those of the sculptures and some others being taken with his own camera, for which his wide-angle and telephoto lenses would have been particularly useful. When war broke out in 1914, Hogarth was responsible for securing a position for Lawrence in the Geographical Section of the War Office. However, as the situation in the Middle East deteriorated, with Turkey taking up arms against Germany and its allies, men with Hogarth and Lawrence's specialist knowledge of the region were urgently needed, and were drawn into Military Intelligence. Hogarth set up a new Intelligence unit, the Arab Bureau, in Cairo, while Lawrence became involved with the Arab Revolt against the Turks, fighting almost continually in the field in a two-year campaign with the forces of the Emir Hussein of Mecca. Lawrence did not forget his photography and a number of his photo graphs of this extraordinary campaign have survived. His experiences are described in his book, now a modern classic, Seven Pillars of Wisdom, first published in 1926. The story of Lawrence after the war is well known. He was disillusioned by the treatment of the Arabs at the Versailles Peace Conference of 1919 but felt that Britain had finally discharged her wartime promises when, at the Cairo Conference of 1921, the Emir Faisal was given the throne of Iraq. He also found it increasingly difficult to cope with the considerable publicity surrounding his wartime exploits. He withdrew from public life and re-enlisted in the services under a series of assumed names, serving first with the Royal Air Force and then with the Tank Corps before being transferred back to the RAF, first in Cranwell, then in India, and finally at Plymouth. He retired in March 1935 after twelve years service in the ranks, but only a few weeks later died as a result of a motorcycle accident. Further reading: Jeremy Wilson, T. E. Lawrence (National Portrait Gallery: London, 1988).